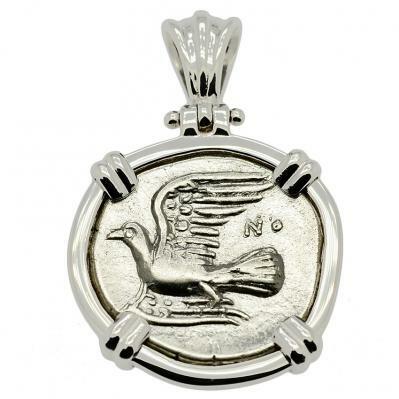 SOLD Sikyon Dove Triobol Pendant; Please Explore Our Greek Pendants For Similar Items. Sikyon was an ancient Greek city, situated in the northern Peloponnesus between Corinth and Achaea, about two miles from the Corinthian Gulf. This city was a famous Greek center for the arts. It gained pre-eminence in woodcarving and bronze work, which can still be seen in the archaic metal facings found at Olympia. In Sikyon, the art of painting was supposed to have been invented and also their pottery was highly prized and exported to distant lands. 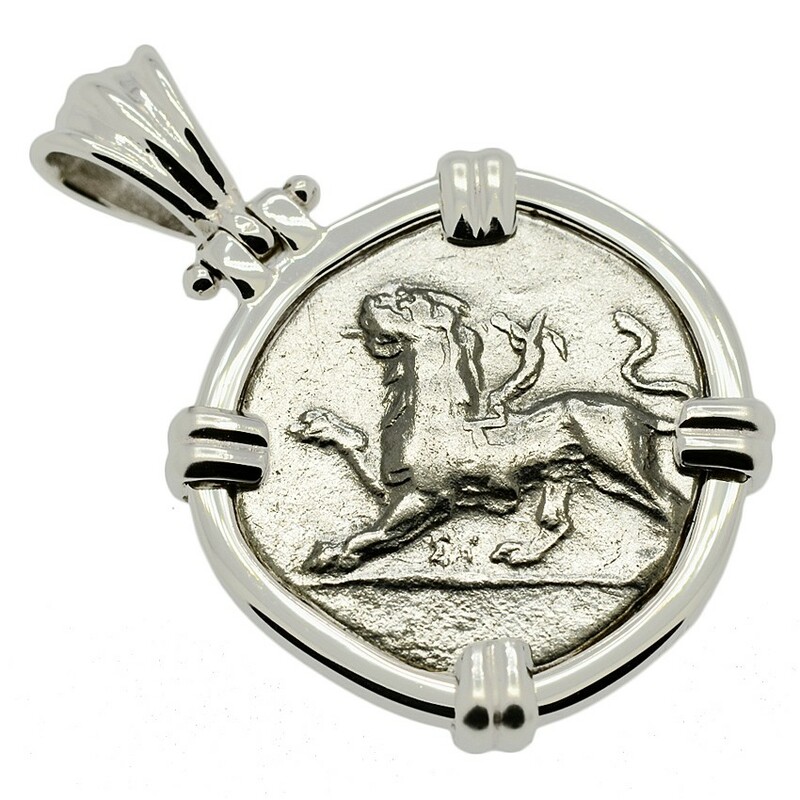 Sikyon was one of the first cities in Peloponnese to issue coinage and these ancient Greek Dove coins were first minted there in the beginning of the 5th century BC. This obverse of this coin features the image of a flying Dove, with the Chimaera on the reverse. To the ancient Greeks, the Dove symbolized spirit and renewal. The Dove was also the sacred animal of Aphrodite, the goddess of love. The Chimaera was a female mythical fire-breathing creature with the body of a goat, the head of a lion and a snake for a tail. Sighting the Chimaera was an omen of storms, shipwrecks and natural disasters, particularly volcanoes. 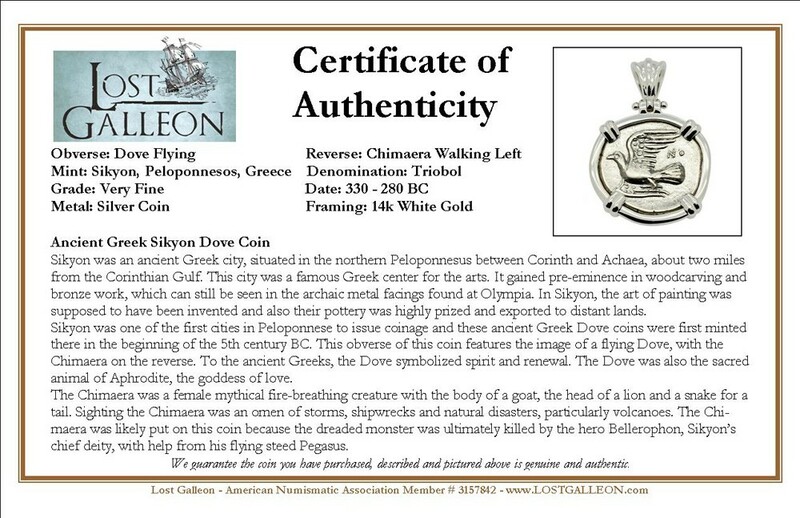 The Chimaera was likely put on this coin because the dreaded monster was ultimately killed by the hero Bellerophon, Sikyon’s chief deity, with help from his flying steed Pegasus.